With his arrival comes a duty which every one of us must discharge. It is a duty to our country and to every mother’s son serving in the forces. Each and all must have a financial stocktaking. When you have accumulated all your available cash, wend your way towards Albert Square and invest the money in the Tank. By so doing you will have helped our just and righteous cause, and hasten – to bring our fighting laddies home. Bear in mind you are not asked to give your money away. It is wanted as a loan to the nation to enable the Government to finish the war, and for it you will get 5 percent. The lowest sum you can subscribe is 15s 6d, and for every such sum you will receive at the end of five years £1. And who knows you may win a handsome prize out of the £500 that is to be given away every day. I think the proper Tank Week spirit is to be found in the incident which the Provost of Forfar tells. The first subscription to the Tank he received was £50 from a widowed mother of a deceased Canadian soldier. That £50 was part of her pension money. Why? So that he and all the others on Britain’s roll of fame may not have died in vain. Preparation for the visit of the Tank, which will start business in the city on Monday, are well nigh complete. It is up to every citizen to make the campaign a success, to bring a result which will ever redound to our credit, and one which will bring our city into favourable comparison with other great, competing centres. Tayside has poured out its manhood for the cause, our money must flow into the coffers of the Tank. Sapper J. McDonnell, R.E., of Smellies Lane, Lochee Road, Dundee, has forwarded an interesting account of a function held behind the lines to commemorate “Burns Nicht”. “It was a real gathering of the clans”, the soldier writes “About 1000 Scots, all from Bonnie Scotland, were present. There was an endless variety of good things, and all the boys were absolutely laden. The concert followed, and we all sung lustily old Scotch songs. A lecture on the National Bard was delivered by the minister. We finished up by singing “Lead, kindly light”, “Auld Lang Syne” and ”God Save the King”. We gave three cheers for the lecturer – and nearly brought the house down, for everyone knows how a Scot can cheer. The minister attempted to speak, but he was so deeply touched that the words failed to come out”. The number of men whom provision was made during January at the Soldiers’ Hostel was 348, an increase of 83 over any previous record. There had been nights when 16 men had come for shelter, and only 11 beds had been available. These revelations were made at the monthly meeting of the Women’s War Relief Fund Committee on Tuesday. The figures, it was stated, justify the steps taken by the Committee in securing larger premises in the Y.M.C.A., where it was hoped to start with 30 beds. Educated women between the ages of 18 and 35 wanted to train for AIRCRAFT and other forms of MUNITIONS WORK. Maintenance allowances are payable during training, and also the fares of women living at a distance. Candidates are required to pass a medical examination. Good prospect for competent workers on the completion of training. For the week the results in the other towns were:- Aberdeen, £2,577,031; Leith, £1,722,565; Edinburgh, £4,764,639; Liverpool, £2,061,012. 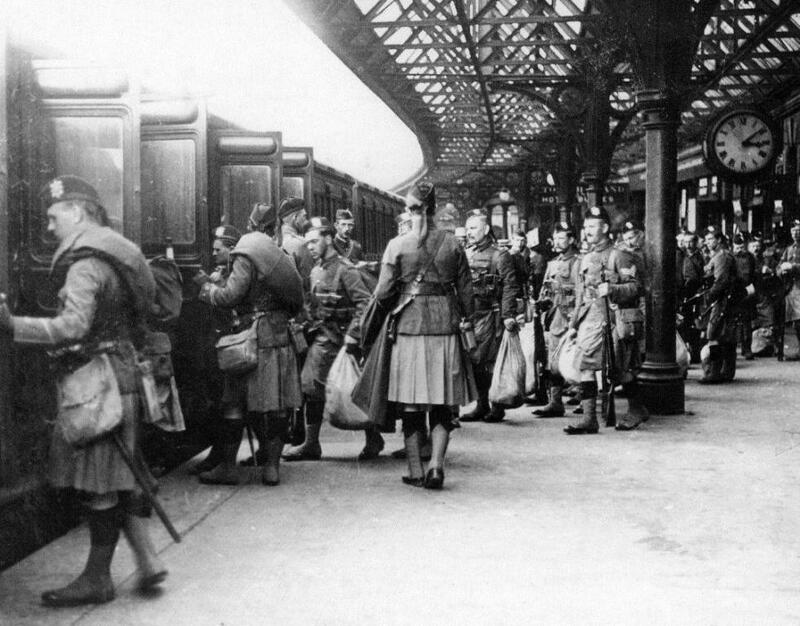 A unique opportunity is offered the citizens of Dundee to help to provide the boys of the Territorial Battalions of the Black Watch serving overseas with the many little comforts which make all the difference. A grand concert is to be given by the Black Watch Pierrot Troupe. “The Night Birds”, on the afternoon of Saturday, 9th Feb, in the Victoria, Victoria Road, which has been kindly lent for the purpose by the proprietors. All profits go to providing comforts for the boys of the Territorial battalions of the Black Watch. Picture-house goers will be delighted to hear that Charlie Chaplin will be shown in “The Adventurer” at La Scala, during the week. There will no doubt be packed houses throughout the week, and the management have wisely agreed to open the picture-house at 11 a.m. each day. Charlie Chaplin needs no introduction or commendation. His abilities as an entertainer, his versatility and the extreme ease with which he performs his “stunts” are known to all. During the former part of the week “The Adventurer” will be supplemented by several extremely fine films, amongst which “The Saint’s Adventure” is outstanding. On Thursday, Friday and Saturday Miss Anita Stewart - a favourite with all – will appear in “Clover’s Rebellion”, a charming dramatic picture. The “People’s Journal” is willing to assist readers to discover the whereabouts of soldier friends. Notices are issues free of charge. The particulars should be stated in this form:- (1) Name of soldier missing: (2) where and when last heard of: (3) relationship: (4) name and address of persons making inquiry. Replies can only be given through this column. No money should be paid to any person for making inquiries. Lorimer – Reported missing on 26th Sept. 1917, No. 33039 Pte. James Lorimer, Royal Scots. Any information regarding him will be gratefully received by Miss C. Walker, No 3, Churchill Place, Broughty Ferry, Dundee. Gove – No. 21635 Pte Wm. J. Gove, Seaforth Highlanders, first reported wounded and in hospital on 22nd Aug. 1917, afterwards wounded and missing. Parents inquire. Rodger – Corpl. George H. Rodger, 270881, Royal Scots. Last heard of 22nd Oct. Any information greatly welcomed by his wife. Duncan – Pte. Wm. A. Duncan, 18075, Gordon Highlanders, reported missing in Aug. 1917. Wife inquires.